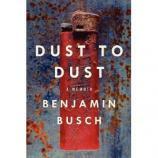 Dust to Dust is a memoir by Benjamin Busch, son of the novelist and short story writer, Frederick Busch. Dust to Dust is an extraordinary memoir about ordinary things: life and death, war and peace, the explorations of childhood and revelations of adulthood by Busch–a U.S. Marine who served two combat tours in Iraq, an actor on “The Wire,” and son of celebrated novelist Frederick Busch. It looks like a good one. Publication date is March 20.